In August of 1979, Rev. William Boggs and wife Sis. Joyce Boggs, felt the calling of God to start an Apostolic church in the city of Jamestown, Ohio. 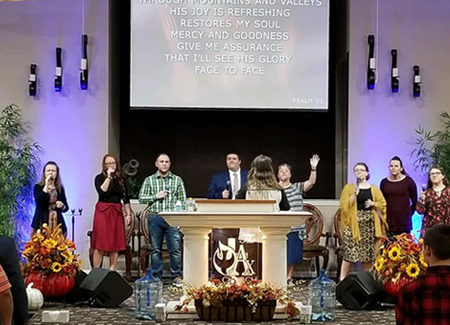 Nine attended the first service of the new church, appropriately named the Apostolic Gospel Temple. In the first year that the doors were open, the Apostolic Gospel Temple baptized over 100 people in the name of Jesus Christ. In only five years’ time, the building in Jamestown was not adequate enough to meet the needs of the congregation; so, in 1984 Rev. Boggs purchased a building located at 73 High Street in Xenia. After nearly 20 years of pastoring and after leading the Apostolic Gospel Temple to great growth, in November of 1998 Rev. Boggs appointed his son-in-law, Rev. Victor Vera, as pastor of the church. After only five years of ministering, Rev. Vera and the congregation were once again out of room. 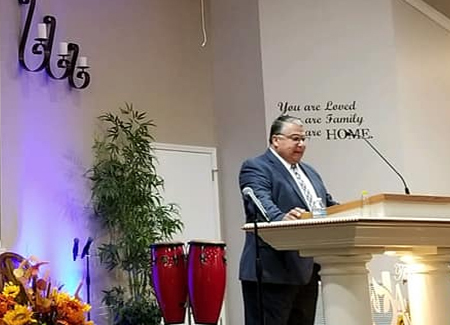 Pastor Vera held firm to his vision that the Apostolic Gospel Temple would one day occupy a building located on the highway. After a brief search, the Lord directed Bro. and Sis. Vera to a twelve-acre plot of ground at the intersection of two major highways. We quickly closed the deal and planted our name – our new name The Apostolics of Xenia – on this fallow ground promised by the Lord. We met a man named Don Kiley – architect and builder. After intense negotiations and planning, on May 21, 2003 we signed the contract for the construction of our new building. A building, a vision from the Lord, was about to be transcribed from pen and paper to wood, brick, and mortar. On May 11, 2003 we broke ground on our promise. A few days later, Don Kiley went to work. He poured a foundation, built walls, installed trusses… And worked to build us and the Lord a house. He put up shingles and installed a steeple. Meanwhile, the Apostolics played softball and had picnics. But, like the kind of people we are, we just couldn’t wait to get in the new building. So we held our first service in the new building before there was carpet, drywall, or insulation. And Bro. Vera preached, and preached, and preached. He preached “Standing on the Promises” and I proclaim to you that we are still standing on the promises of God. On March 12, 2004 Don Kiley notified our pastor that all permits and inspections were final and that the building was ours to occupy. So in two days’ time we made a mass exodus from 73 High Street to 978 St. Rt. 42 South. Nearly 100 people attended the first service. Nearly 150 visitors would come in the first five weeks of service. Today, Bro. and Sis. Vera are continuing the apostolic legacy of revival. We are already planning phase 2 and phase 3 of construction with a goal to develop the entire twelve acres that God blessed us with.